In today’s complex global business environment, organizations are made up of diverse workforces (Boomers, Gen X, and Gen Y) that include both management and non-management personnel. Within these same organizations, a multitude of communications, collaboration, and social networking tools have been implemented to support operational effectiveness. 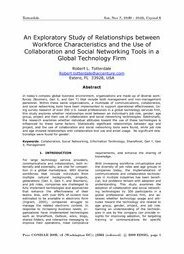 Using survey research of over 300 U.S. based professionals in a global technology services firm, this study explores whether relationships exist between an individual’s job role, gender, age group, project and their use of collaboration and social networking technologies. Additionally, the research examines whether individual attitudes toward the use of these technologies is influenced by these same factors. Statistically significant relationships between age and project, and the use of collaboration and social networking tools were found, while job role and age showed relationships with collaboration tool use and email usage. No significant relationships were found for gender.